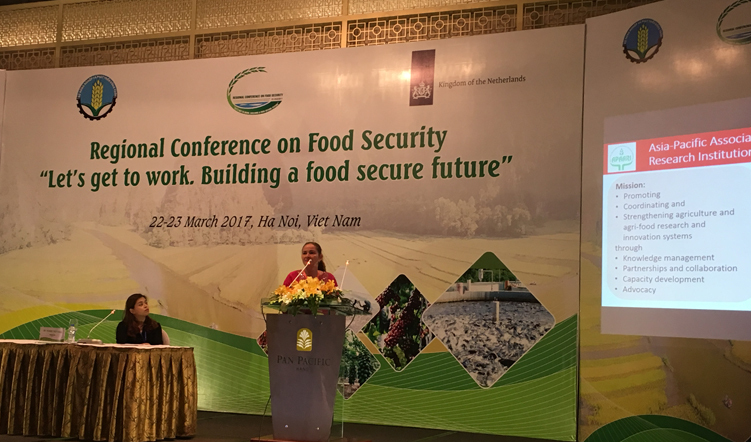 From 22-23 March 2017, APAARI participated in the regional conference ‘LET’S GET TO WORK – Building a food secure future’ held in Ha Noi, Viet Nam. The conference focused on reduction of food waste and food losses to implement new solutions for the relevant Sustainable Development Goals (SDGs). It was organized by the Government of the Netherlands and the Ministry of Agriculture and Rural Development (MARD) Vietnam, in close cooperation with the World Bank, the Food and Agriculture Organization of the United Nations (FAO), Grow Asia, Association of Southeast Asian Nations (ASEAN) and the Asian Development Bank (ADB). The two-day conference brought together government ministers and other high-level delegates from government, international organisations, non-governmental organizations (NGOs), knowledge institutes and the private sector. It had an action-oriented character and aimed to come to Food Security Initiatives (Deals) during several working group sessions. Subthemes of the conference were: food loss reduction; sustainable aquaculture; climate smart agriculture; and food safety. APAARI made a contribution to the session on climate-smart agriculture (CSA). Firstly, it shared its relevance to the SDGs and key strategies supporting SDG 2 (zero hunger), SDG 13 (climate action), and SDG 17 (partnership for the goals). While APAARI is indirectly contributing to SDG 1, 5, 6, 7, 8, 12, 13, 14, 15, 17, the most germane one to APAARI is SDG 2 – Ending hunger and achieving food security and improved nutrition and promote sustainable agriculture. For this SDG, all the proscribed detailed targets by the UN are in the mainstream of APAARI’s future contributions to sustainable agricultural development, namely: shifting towards healthier diets; ensuring the supply of safe, nutritious food; zero hidden hunger; doubling productivity and incomes; strengthening capacity for climate change adaptation; maintaining the genetic diversity of seeds and genetic resources; and women’s empowerment. 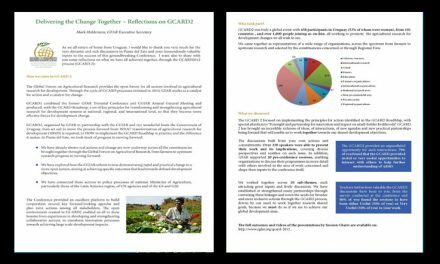 The presentation stressed APAARI’s work in promoting knowledge sharing, capacity development, advocacy for improved and increased investments in agri-food research and innovation, and facilitating partnerships for collective action to bring innovative and sustainable solutions to small farmers. APAARI recognized that climate change is a critical challenge to agriculture that is likely to reduce agricultural production by 10-50% by 2050 if adaptation measures start late. While some areas may benefit agriculturally, many more will be adversely affected. As such, APAARI provides knowledge-sharing mechanisms to discuss good practices in CSA and other sustainable agricultural practices to adapt to and mitigate the effects of climate change, and reduce stress on natural resources. Advocacy for increased and improved investment in agricultural research and innovations, and other critical areas supporting sustainable agricultural development, is another area of support that was highlighted. Through its knowledge-sharing processes, APAARI also creates an environment for increased resource allocation and congenial policy and institutional support, and facilitates partnerships to strengthen collective action in its key thematic areas. An example is the recent High-level Policy Dialogue on Investment in Agricultural Research for Sustainable Development in Asia and the Pacific that APAARI organized in partnership with the Australian Centre for International Agricultural Research (ACIAR), Government of Thailand, FAO, Global Forum for Agricultural Research (GFAR) and International Food Policy Research Institute (IFPRI). Regional networks have been recognized as playing an active role in advocacy and knowledge management to support CSA and other development areas. 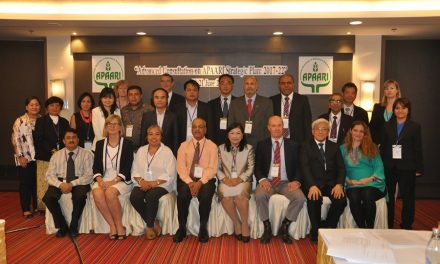 APAARI’s strong links and partnerships with national agricultural research and innovation systems and between national, regional and global stakeholders are its comparative advantage. As such, APAARI has the ability to create synergies and mobilize partnerships since collective actions are the key to its operations. APAARI also has the ability to bring national issues facing agri-food systems to the regional and global levels, for example through expert consultations, policy dialogue and representation at GFAR. However, the Association also needs to improve its engagement with the private sector, civil society and donors in the collective actions of APAARI, increase its membership from ASEAN countries, improve research-extension linkages, and mobilize resources for operations. The conference introduced the concept of food security deals that are concrete, cross-sectorial deals made by different stakeholders through which they commit themselves to action to combat food security issues. APAARI made two deals for collective action. Firstly, it linked up with SNV Netherlands to promote the efforts on improving information sharing with aquaculture farmers in Vietnam at the regional level. 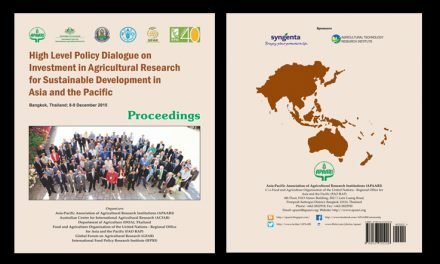 Secondly, APAARI expressed its efforts to improve engagement with the private sector, civil society and ASEAN countries to strengthen collective action in agri-food research and innovation. The objective would be to maximize synergies between various processes and actions involved in agricultural research and innovation to improve food security. APAARI will follow up on these deals and actions after the conference.